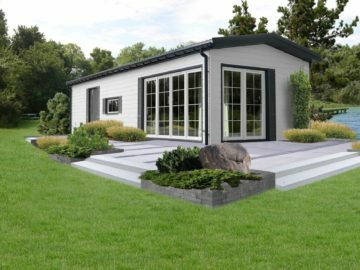 We offer you practical, comfortable and functional all-year around mobile homes, available in several versions, differing in size, contents equipment and finishing details. Each of the houses is made based on the readymade design or an individual order. Our clients have the possibility of modifications made to the room layout as well as choice of contents equipment. 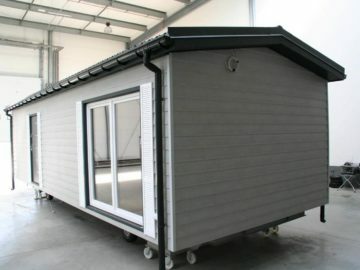 We can also adjust the dimensions of your mobile home according to your needs. We are happy to make an individual interior design to provide you with the highest comfort of use. We also offer you our advice to make sure that the solutions that we plan along with you will allow you to buy a functional yet an esthetic house ensuring comfort and convenience. This mobile home will serve you for many years. 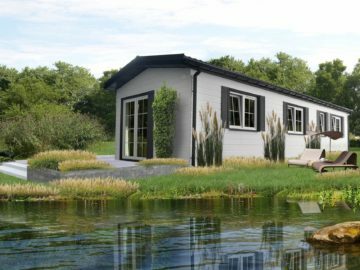 The decision to buy a mobile home is a perfect solution for those, seeking a functional, comfortable, and most importantly new all year-round mobile home on a plot of land that will accommodate the whole family. 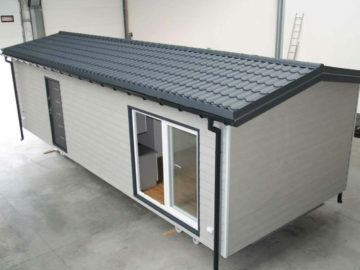 Mobile all year-round home will give you the opportunity to enjoy your rest also in the colder seasons – we have taken care of the walls, floors and roofs insulation, hence installation of practical electric heating allows you to get the desired temperature during colder days quickly. 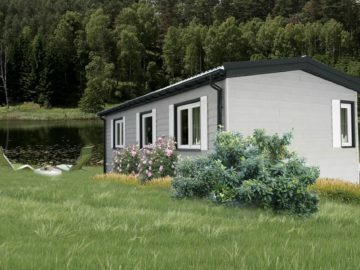 Our new mobile homes are fully finished and ready to live. We use only the highest quality materials and we choose the content equipment of the house to meet your expectations. 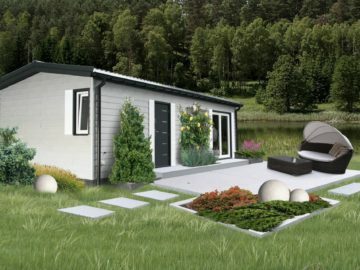 How do we make mobile homes? The houses of our production are constructed in a way that ensures their durability, and to give their owners a sense of comfort. The internal structure of the mobile home consists of a steel frame (that has been properly protected against corrosion) and a wooden frame. In order to ensure proper comfort in any weather the walls of the mobile homes are suitably insulated. That’s way mineral wool of 10 to 15 cm thick has been used. 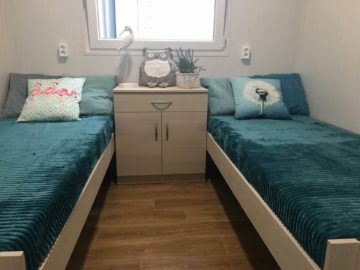 On special customer’s request the walls of the mobile home can be insulated with PUR foam, which is an innovative method used for building insulations. For the sake of your thermal comfort, we also use double insulation – it is a windproof membrane and a vapor barrier. From the outside, the walls are paneled with the facade cladding made by Belgian company called Durasid or well known Polish brand – VOX. 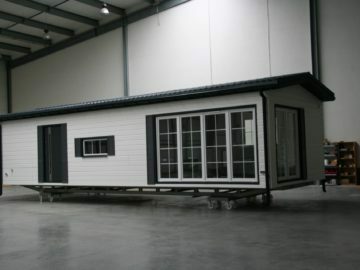 Due to this solution, the facade of the mobile home practically does not require any maintenance – the panel we use are of very high quality, resistant to any weather conditions. Its appearance resembles wood therefore fits perfectly with the house surrounding landscape. Internal walls are also properly finished. In order to do this MDF or PVC wall assemble panels are used. These panels are of high quality, durable and also resistant to dirt. Their colors make the interior of the mobile home to feel cozy and of impeccable look. The floor is lined up with a practical PVC floor covering which we offer in many colors and patterns, it can also be finished with vinyl panels. Both solutions are aesthetical and practical, as well as resistant to moisture. Our houses consist of high-quality five-chamber windows with an additional ventilation. You can individually determine how many windows will there be in your house as well as their sizes. Additionally there are options of having tilting or sliding balcony doors. 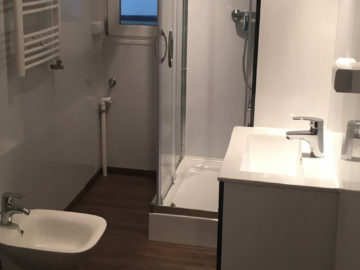 Each of our mobile homes has a complete electrical system including an energy-efficient LED lighting which has been installed inside as well as outside of the premises. Outdoor lighting is extremely decorative, the house looks attractive, and it provides its residents with great sense of security. Obviously there are also complete modern water and sewage systems. We offer an electrical heating in our mobile homes with radiator in each room. 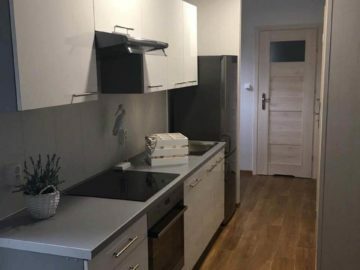 However, at the special client’s request the house can be equipped with a central gas installation, which works in cooperation with a dual-function oven and a set of appropriate radiators. Send us a message – we give you the best offer! I accept using my personal details, filled in this form for marketing purposes, by data administrator of Eco Mobile Home Sp. z o.o. based in Latchorzew, 212 Warszawska street, 05-082 Latchorzew, according to law act about personal details protection. Make your dreams of freedom come true with us. Thanks to our mobile homes you can live anywhere. And literally! In a well-equipped functional space. We offer high quality, original designs and reliable advice. Individually, yet comprehensively – that’s how we work for you. © 2019 Quality Factory - Agencja SEM All rights reserved.